UNIVERSITY OF ARIZONA—The discovery of a 10-year-old’s body at an ancient Roman site in Italy suggests measures were taken to prevent the child, possibly infected with malaria, from rising from the dead and spreading disease to the living. The skeletal remains, uncovered by archaeologists from the University of Arizona and Stanford University, along with archaeologists from Italy, included a skull with a rock intentionally inserted into the mouth. Researchers believe the stone may have been placed there as part of a funeral ritual designed to contain disease – and the body itself. In previous excavations at the Cemetery of the Babies, archaeologists found infant and toddler bones alongside items like raven talons, toad bones, bronze cauldrons filled with ash and the remains of puppies that appear to have been sacrificed – all objects commonly associated with witchcraft and magic. In addition, the body of the 3-year-old girl had stones weighing down her hands and feet – a practice used by different cultures throughout history to keep the deceased in their graves. “We know that the Romans were very much concerned with this and would even go to the extent of employing witchcraft to keep the evil – whatever is contaminating the body – from coming out,” Soren said. Although the 10-year-old’s remains have not yet undergone DNA testing, the child had an abscessed tooth – a side effect of malaria – that suggests he or she may also have fallen victim to the disease, Wilson said. The child was one of five new burials uncovered at the cemetery over the summer. 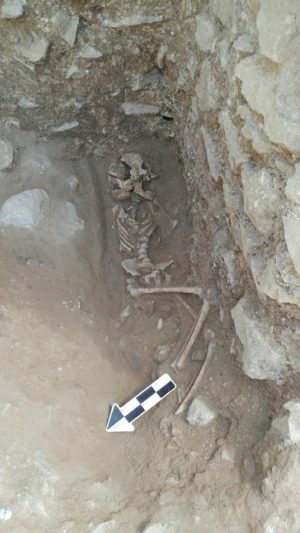 The body was found lying on its left side in a makeshift tomb created by two large roof tiles propped against a wall – an alla cappuccina-style burial typical of Roman Italy. The open position of the child’s jaw, which would not have opened naturally during decomposition with the body positioned on its side, suggests that the rock was intentionally inserted in the mouth after death, Wilson said. Teeth marks on the surface of the stone provide further evidence that it was placed purposefully. For a more in-depth article about “vampire burial” practices discovered through archaeology, see the previously published free premium article, Walking Dead and Vengeful Spirits, published in Popular Archaeology.